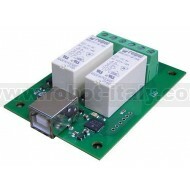 The USB-RLY02 provides two volt free contact relay outputs with a current rating of up to 16Amp each. The USB-RLY02 is powered and instructed from any standard USB bus and does not require any additional power. The USB-RLY02 provides two volt free contact relay outputs with a current rating of up to 16Amp each. The USB-RLY02 is powered and instructed from any standard USB bus and does not require any additional power. 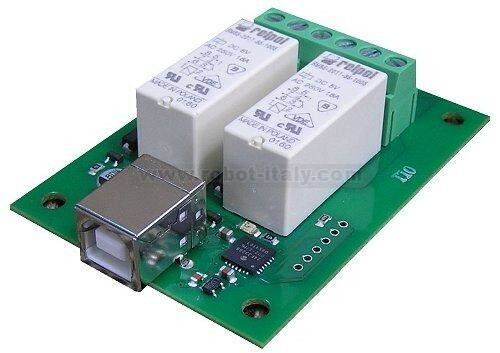 The relays are SPCO (Single Pole Change Over) types. The normally open, normally closed and common pins are all available on the screw terminals. The USB-RLY02 provides a red LED mounted immediately next to each relay to indicate whether it is in a powered state (LED on). If the contact load voltage and current of the relay are in the region below the solid line in the figure below, the relay can perform stable switching operation. If the relay is used at a voltage or current exceeding this region, the life of the contacts may be significantly shortened. The USB-RLY02 module uses the Microchip PIC24FJ32GB002 to handle all the USB protocols. Before using the USB-RLY02, you will need to download the Devantech inf files and unzip them into a temporary folder. Connect the RLY02 and windows will detect it and ask for the drivers. Point windows to the inf folder and it will install the driver. The RLY02 will now appear as a com port. After installing the drivers, and plugging in the USB-RLY02 module to a spare USB port, you will want to know which COM port it has been assigned to. This will vary from system to system depending on how many COM ports you currently have installed. To find out where it is, right click on your "My Computer" desktop icon and select the "Device Manager" tab. Now scroll down and open the "Ports (COM & LPT)" tab. You should see the USB serial port listed - COM2 in the example below. If you want to change the COM port number - just right click on it, select properties, select advanced and select the COM port number from the available list. The COM port may be left at the default baud rate etc, because they are not actually used - there is a direct USB connection into the processor. The USB-RLY02 operates with an easy to use command set as described in the table below. Most commands are only a single byte and if applicable the USB-RLY02 will automatically send its response. The only exception to this being the "Set relay states" command which requires and additional desired states byte to be sent immediately after the command byte. To get the USB-RLY02 up and running in the minimum amount of time we have put together a RelayTestprogram to demonstrate the functionality of the module. The RLY08 provides eight volt free contact relay outputs with a current rating of up to 1Amp each. The USB-RLY08B provides eight volt free contact relay outputs with a current rating of up to 1Amp each.